You've always wanted to make your beautiful items that you've poured your heart and soul into making look even more professional when shipping them to your customers, displaying them at markets and shows or wrapping them up in your brick and morter shops. Now is your chance. 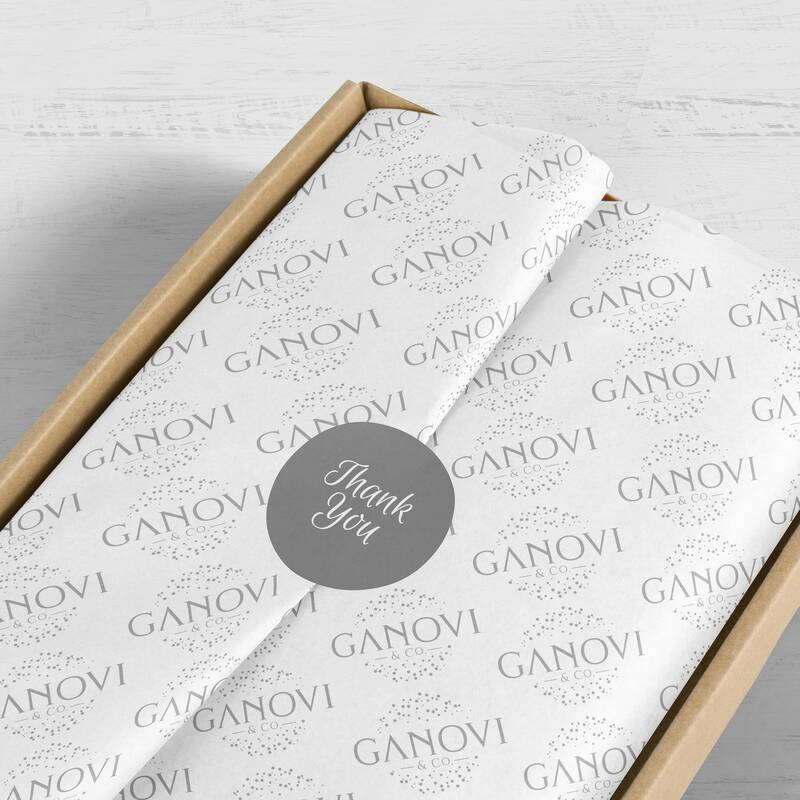 The branded tissue paper that my dad and I have created will make your items and packages totally unforgettable. 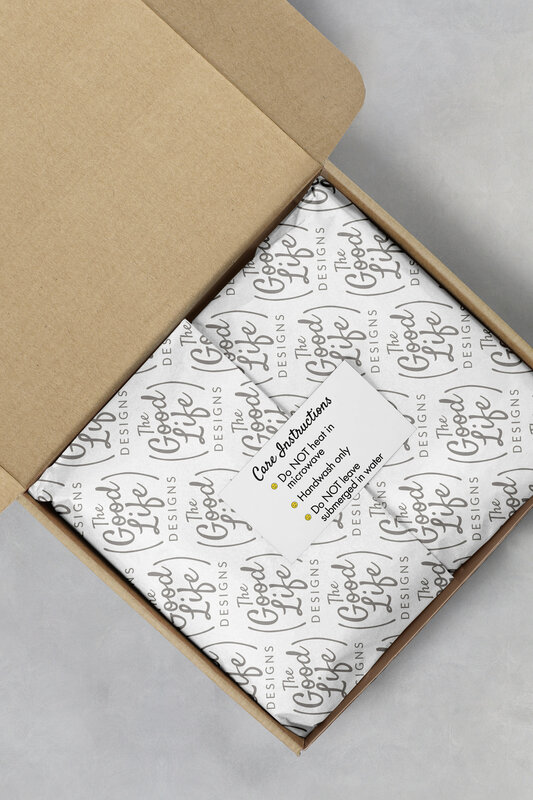 After I design the tissue paper with your logo, my father, an experienced printer of 23 years, will do a fabulous job printing it. We have spents months testing and developing this and finally found just the right paper and right price point for so many of you. -Each sheet is 17 X 11 inches. -We also have listings for 100, 200 and 500 sheets. Here are links to each of those listings/quantities. -This is thicker than standard-issued tissue paper, which for many companies and shop owners is a good thing! It provides added protection for your cherished items. -We print on one side only. -Your logo will be printed in gray. -Please attach in an Etsy convo or email a high-res version of your logo to TheEnchantedEnvelope [!at] gmail.com. Please be sure to include YOUR NAME and YOUR COMPANY NAME so we can match up the orders. -High res PDFs work best. But we can also work with PNGs or JPGs. -There may be times when some full logos are a tad too detailed. 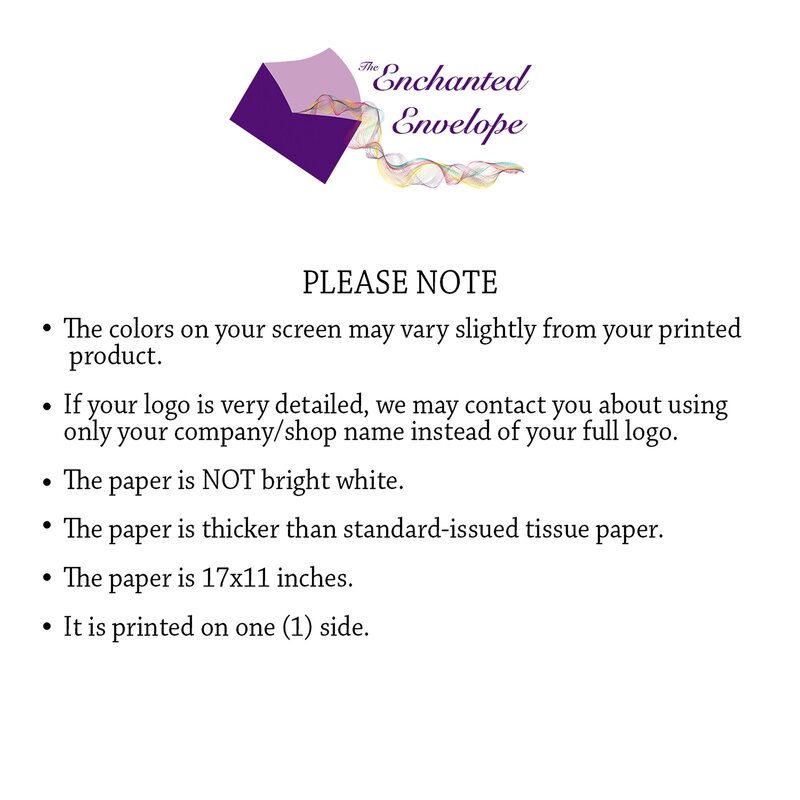 At that point, we will contact you and suggest using just your shop name for your tissue paper. -The colors on your screen may vary slightly from your printed product. -Proofs will not be automatically sent. One complimentary proof, however, is available upon request. Each additional proof is $5.00. While we do NOT automatically email proofs, we will email you a low-res proof upon your request. Please know that the faster you respond, the sooner you will get your order! We ship via UPS and USPS. We strive to keep shipping costs as low as possible. If you order multiple items and we feel we can lower the shipping costs calculated by Etsy, we will send you a coupon credit toward a future purchase! We will always do our best to help you track a package. However, we are NOT resposible for packages that are lost or delayed in transit via USPS, UPS, FedEx, or any other carrier. And we cannot guarantee arrival times. Our posted 'expected' delivery dates are just that ... EXPECTED. They are simply estimates based on what normally happens with items we ship and what the carriers post on their ends for the selected method of shipment. Unfortunately, items get delayed in transit, and there is nothing we can do about that as the seller. But if something doesn't get to you in a timely manner, please let us know. Because computer monitors vary, the color on your finished product may differ slightly from what you see on your screen. Our logo is printed on the back of the folding notecards and notepads. If you would like it removed, we can do that for a $5.00 charge. Please message us if you’d like that option. In addition, if you would like to add your own logo to the backs of the cards, that is an additional $7.50. All of our paper is FSC certified paper and it is all manufactured in wind-milled powered mills in the United States! Our cover stock ranges from 80lb. to 120lb. with varying colors and textures. Please see the individual products for specifics. All of our products are packed carefully to prevent shipping damage. Some are packed in cello bags and then shipped in a bubble-wrapped envelope and others are shipped in boxes before being packaged. It very much depends on your order. 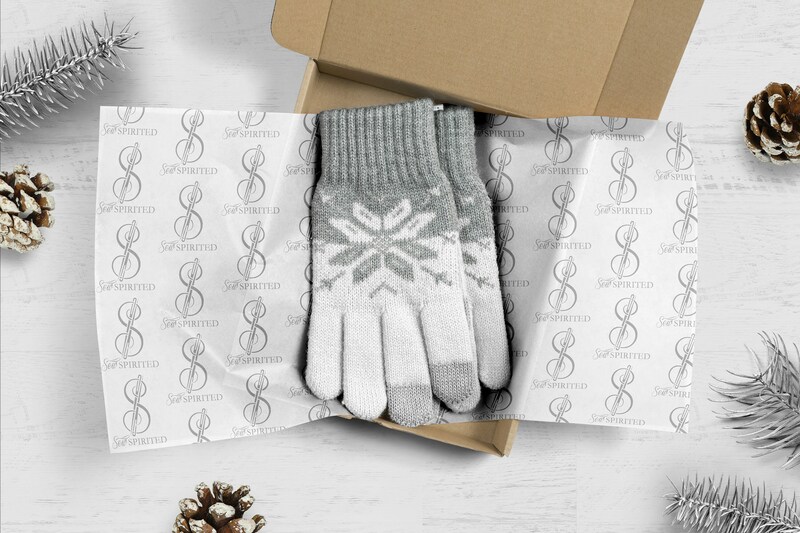 You often have the option to upgrade to a gift box! 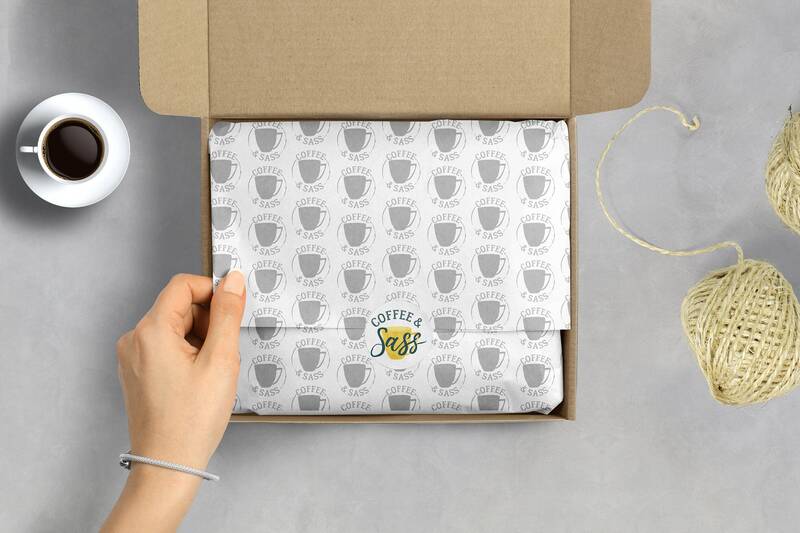 Sometimes gift boxes are even free! If a product is damaged during shipment, it is the responsibility of the customer to file a claim with UPS or USPS. If you need help with this, please contact us. If UPS or USPS determined your order was improperly packed, we will take responsibility for that. Because our items are all personalized, it does take a little time on our end, and it is very much based upon the product. However, most items have a product time of 3 to 10 business days. Once they are shipped, most will arrive within 2-3 days. If you need a product faster than 3 to 10 business days (each product is different and we have a more specific time frame listed on each item), please contact us and we will work hard to get it to you faster. (Expedited fees may apply). Because our items are personalized, we generally do not accept returns or give refunds. However, if the product was produced correctly, and you are not satisfied, please let us know. We will do our best to work with you. In addition, if there is a mistake that we made, we will correct your order free of charge. It’s gorgeous, can’t wait to use it for our weddings!